What’s the connection between Doctor Who and the most recent James Bond film, Skyfall? Both were partially filmed on MOD land. If this conjures visions of Daniel Craig, trailed by a film crew, trying to avoid entering a Range Danger Area or a squad of soldiers attempting to sidle into the back of shot, think again. I’m Tony Burlton, Filming and Events Manager at Landmarc Support Services. I manage the enquiries and income generation for filming and events across the MoD’s national training estate. I have been working in the area of third party income generation for some 12 years now and have seen a rapid increase in the demand for film locations in the UK, thanks mainly to some generous tax breaks for production companies. HM Treasury wants Government departments to make more efficient use of their assets for taxpayers by looking for opportunities to offer spare capacity in return for revenue. Actually it’s something the MOD has been doing very well for some years especially when it comes to the military estate. In the 2013/2014 financial year, all third party income generation activities combined resulted in more than £2 million of revenue for the MOD. So what does this mean in practice? Well, for years DIO has been undertaking third-party income generation – essentially allowing a third-party to use spare capacity on the estate in return for commercial revenue. A whole host of activities occur ranging from filming feature films, TV drama and music videos to the more everyday use such as motor sports, mountain biking and farming. We’ve even had the slightly wacky, such as husky dog sledging and ghost detection (I kid you not!) The one thing these activities have in common is that together they generate a very useful revenue stream for DIO. Areas of the military estate are sometimes rented to civilian mountain bikers for organised events. Under the new National Training Estate Prime (NTEP) contract, Landmarc, DIO’s strategic partner, manages third-party activity on the military estate with support from DIO’s Land Management Services, which licenses the activities and a host of others which offer advice on aspects of insurance, risk management, health & safety and environmental matters depending on the activities undertaken. So how does all this activity fit around training? Although the estate is always busy in terms of training exercises it is large enough that there are areas free at certain times which can be used to facilitate various income-generating activities. It is the third-party that has to fit in with the training schedules not the other way around and events are always managed and controlled, properly licenced and approved by the appropriate chain-of-command on the ground. In other words, they are not ‘random’ events! Landmarc provides a safe area and keep an eye on things to make sure they do not interfere with any ongoing training. Together, DIO and Landmarc have facilitated a number of high-profile films on the estate. Salisbury Plain Training Area became the Russian steppes for Anna Karenina while on the heathland of Hankley Common James Bond’s Skyfall Lodge took shape, only for it to be blown up at the end of the film! Not so long ago Tom Cruise was filming Edge of Tomorrow down at Barton Stacey while George Clooney and Matt Damon were filming The Monuments Men at nearby Bramley. 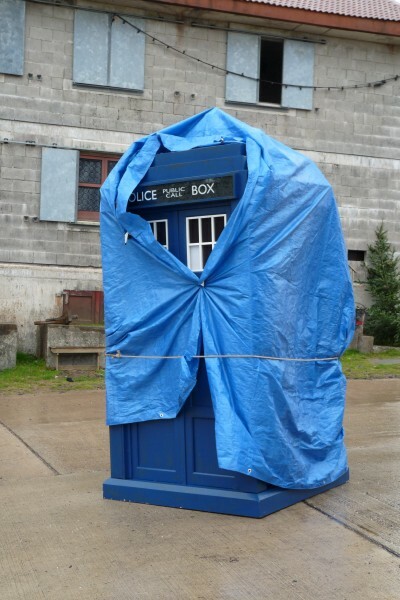 With Doctor Who production offices now based in Cardiff, a number of the Welsh training estate sites have hosted scenes for recent episodes including a Christmas special which was partly filmed at Sennybridge. 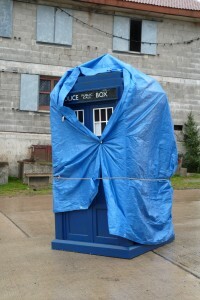 The TARDIS, nearly ready for filming of a Doctor Who Christmas special. Working in the area I do is extremely interesting. No two days are the same – you never know what the next request will bring! It can be for a motor rally wanting to drive through the training estate in Wales, 200 cyclists wanting a wooded area to ride through as part of a race, a request for a bridge that "looks like it could be Second World War" in appearance or even "have you got anywhere I can roll a Range Rover down" for Top Gear? Luckily, due to the diverse nature of the estate there is usually somewhere we can accommodate them. Of course there are frustrations. One of the most challenging aspects of the job is the length of time it can take for all the necessary paperwork to be completed. The filming industry tends to work at a faster pace which means we sometimes get also seemingly impossible deadlines between enquiry and start of filming. The best bit? When you receive an enquiry for a film like Skyfall, go through all the location recces, paperwork and licensing procedures and then start the actual filming. It’s an extremely satisfying feeling knowing that you have contributed to getting the very best out of the estate, raising some money and in many cases getting some very positive PR for the Department (not to mention supporting what has become a national institution). Over the years I have been involved in providing sites for numerous high profile films but my personal favourite has to be the building of Skyfall Lodge on Hankley Common. 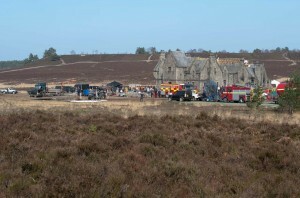 Skyfall Lodge under construction at Hankley Common for the James Bond film, 'Skyfall'. 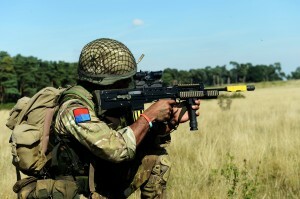 Thanks to the skill and experience of staff on the estate, coupled with the often uniqueness of the sites, the military training estate is a highly sought after resource within the filming industry and the use of its spare capacity results in a ‘win-win’ situation for both parties.